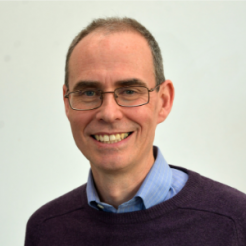 Professor Adam Nelson is Theme Lead for Next Generation Chemistry for Medicine at the Rosalind Franklin Institute, Professor of Chemical Biology at the University of Leeds, and Deputy Director of the Astbury Centre for Structural Molecular Biology. He obtained his PhD from the University of Cambridge (supervisor: Dr Stuart Warren) and undertook postdoctoral research at the University of Manchester (supervisor: Prof. Jim Thomas) before joining the academic staff at the University of Leeds in 1998. His research at the interface between chemistry and biology has been recognised through awards including the RSC Meldola medal (2001), the RSC Corday-Morgan medal (2008) and the European Federation of Medicinal Chemistry UCB-Ehrlich award (2018).